The Sun-Times reports that Samardzija and the Cubs have been sending friendly text messages with smiley faces and sharing late-night phone calls once again. [The Cubs] have quietly reached out to Samardzija with a new offer on a contract that would keep him in Chicago as long as Starlin Castro and Anthony Rizzo, according to multiple sources. The sides have been miles apart for more nearly two years since having initial conversations about a multiyear extension, with differences on issues ranging from dollars to the club’s competitive timeline to management style and stability. But the longer Samardzija has pitched into what is fast becoming his best season, the more he’s looking like the frontline pitcher many expected him to be, and the more outcry that has risen from an already grumbling fan base waiting for this rebuilding process to take traction. Cubs officials wouldn’t comment on the subject Monday. Now I have to say, I’m somewhat skeptical about all of this. It’s entirely possible that the two sides are once again trying to hammer out a deal, but there’s another possibility at play here as well. Just last week we saw a report in the same newspaper that the Cubs had received a number of offers for both Samardzija and Jason Hammel. That’s not surprising because, like I’ve said, Shark has been on the block for a while now, and it was never a secret. Considering how well he’s pitched this season, and how many teams are still in the playoff hunt and could use another starter, of course there’s going to be plenty of interest. Particularly for a player with another year of control. But what if this is all just a negotiating tactic of a different sort? 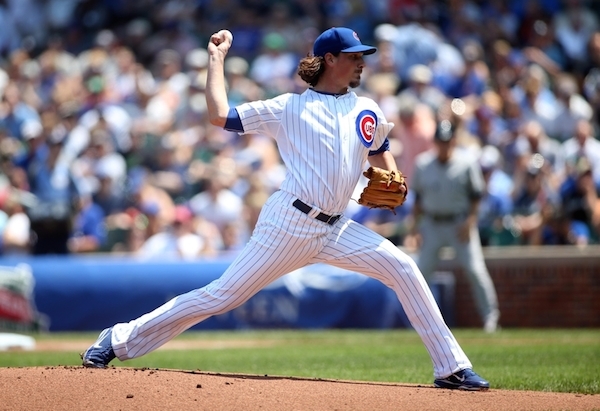 The Cubs have received plenty of offers for Samardzija. Obviously they haven’t received one they liked enough to agree to. Now it’s mid-June, and the trade deadline is approaching when suddenly “multiple sources” are saying the Cubs are working on an extension. Is it not possible that the Cubs themselves are floating this as a method to try and increase the return for Samardzija? Maybe make teams a bit more desperate to make the move? Then you wait and see if the offers improve. Now, I’m not saying this is certainly the case, as I don’t know, but would you be shocked if it were? It just seems strange to me that the Cubs have suddenly reopened the door to an extension when they’ve seemed so intent on trading Samardzija. Especially if it’s due to the “grumbling fan base” mentioned, because I don’t see Theo Epstein and Jed Hoyer suddenly deciding to give the fans one of their “cookies” now that they’re into their third season of their plan. Unless there’s pressure from the owner’s office, anyway, but as we’ve seen from Tom Ricketts’ interactions with rooftop owners, he doesn’t seem like the kind of guy capable of imposing his will. Though I suppose that can change when he has the ability to fire you. Whatever the situation, it seems that the next six weeks or so of Samardzija rumors will be interesting. This entry was posted in Chicago Cubs and tagged Jason Hammel, Jed Hoyer, Jeff Samardzija, Theo Epstein, Tom Ricketts by Tom Fornelli. Bookmark the permalink.